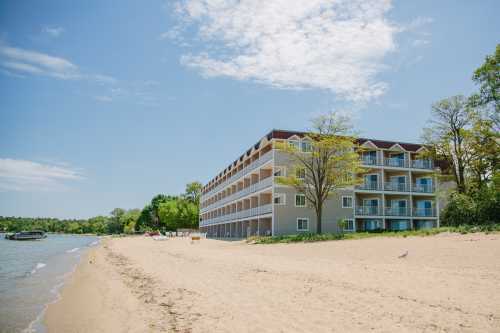 Our Victorian style hotel is nestled on the beach of West Grand Traverse Bay and offers the best of all you love about Traverse City - a great waterfront location and a short stroll away from downtown with its diverse dining, shopping, and nightlife. Most rooms feature a private balcony or patio while some even have in-room spas and fireplaces. Enjoy our complimentary deluxe continental breakfast, indoor pool, private beach, free Wi-Fi, 24-hour fitness center, and arcade room. We are completely smoke-free. Ask about our meeting space for your next Traverse City conference! Description $300 per day. 10 rooms or more and meeting space is free.